1) The ITIC has produced an assessment of “Hamas’ new policy towards Israel“. 2) At the INSS Yoel Guzansky and Oded Eran take a look at “The Red Sea: An Old-New Arena of Interest“. 3) At the JCPA Pinhas Inbari documents how “Erdogan’s Turkey Intensifies Involvement in Gaza and Jerusalem“. “Turkey, under the charismatic leadership of President Recep Tayyip Erdogan, is intervening in many places throughout the Middle East. In each locale, it takes care to unfurl the Turkish flag literally. 4) Matthew Brodsky explains why he supports the recent US decision to leave the UN Human Rights Council. 1) As has been noted here before, the BBC is still unsure about Iranian involvement in the conflict in Yemen. The Washington Post recently published an article titled “How Iranian weapons are ending up in Yemen“. “Weapon shipments intercepted in the Arabian sea by Australian, French and U.S. warships this year contained large quantities of Russian and Iranian weapons, some of which had markings similar to munitions recovered from Houthi fighters in Yemen, according to a new report released by an independent research group Wednesday. 2) Professor Eugene Kontorovich has compiled “A Global Study of Settlements in Occupied Territories“. “This Article provides the first comprehensive, global examination of state and international practice bearing on Article 49(6) of the Fourth Geneva Convention, which provides that an “Occupying Power shall not deport or transfer parts of its own civilian population into the territory it occupies.” This provision is a staple of legal and diplomatic international discussions of the Arab-Israeli conflict, and serves as the basis for criticism of Israeli settlement policy. 3) MEMRI gives a comprehensive overview of the Abbas-Dahlan power struggle. “A recent focus in the Palestinian press has been the power struggle between Palestinian Authority (PA) President and Fatah chairman Mahmoud ‘Abbas and former Fatah Central Committee member Muhammad Dahlan, who was expelled from the movement in 2011 and is currently attempting to influence the Palestinian agenda and to empower his supporters in the face of ‘Abbas’s steps to exclude him from the Palestinian political scene. Dahlan has been demonstrating his strength in a number of ways: in the West Bank and the Gaza Strip through conferences and protests organized by his supporters there, and also through efforts to strengthen ties between Egypt and the Gaza Strip; and in the Palestinian diaspora with conferences organized by his supporters in Lebanese refugee camps and in Europe. At the same time, ‘Abbas is trying with all his might to completely exclude Dahlan and his supporters from Fatah, and to end the ongoing internal conflict in the movement with an institutional resolution to be approved at the Seventh Fatah Conference, which is set for November 29, 2016. The news that some of the last remaining members of the Jewish community in Yemen had been airlifted to Israel brought some rare BBC reporting on the topic of Jews from Arab lands. The story was reported on the BBC News website on March 21st in an article titled “Yemeni Jews brought to Israel in secret mission“. That accurate and impartial report even included information omitted in previous BBC reporting. The BBC World Service radio programme ‘Newshour’ also reported the story in an item (from 30:07 here) which included an interview with the Jewish Agency spokesman Avi Mayer and then later (at 38:55, following a technical fault) with historian Tudor Parfitt. Given the paucity of BBC reporting on the topic of the long history of Jews from Arab lands in general and the religious roots of some of the hostility towards them in particular, it is rather unlikely that statement would have contributed much to audience understanding of background to this story – especially with the curious insertion of the word “now”. Nevertheless, it was good to see some reasonable reporting on a much neglected topic. But of course it is not just the volume of reporting which distinguishes the BBC’s coverage of last summer’s conflict in Israel and the Gaza Strip from its reporting on the ongoing conflict in Yemen: the difference in tone of reporting is remarkable too. 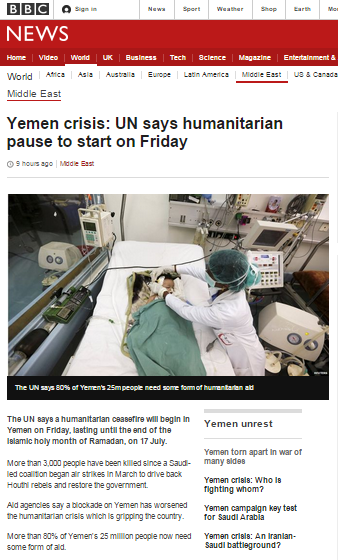 With the casualty toll in Yemen having surpassed that in the Gaza Strip last year, it is worth taking a look at how that news was presented in the latest report to appear on the BBC News website’s Middle East page. “More than 3,000 people have been killed since a Saudi-led coalition began air strikes in March to drive back Houthi rebels and restore the government. Aid agencies say a blockade on Yemen has worsened the humanitarian crisis which is gripping the country. On Tuesday, the UN announced that at least 1,528 civilians were among the 3,000 dead. 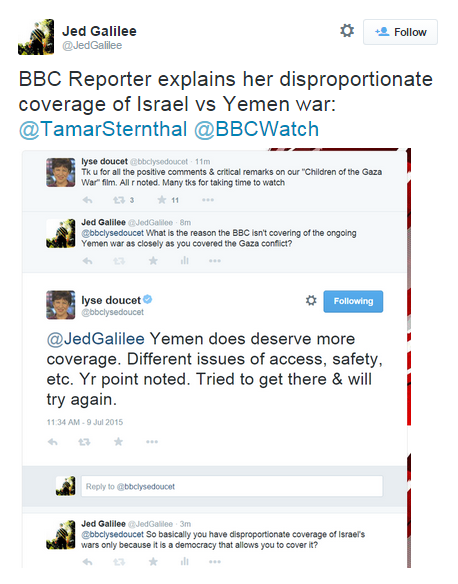 Markedly absent from that factual, non-emotive account are BBC journalists’ amateur opinions on ‘international law’ and the accusations of war crimes, crimes against humanity, collective punishment and deliberate targeting of civilians which characterized the BBC’s reporting from the Gaza Strip last summer. Moreover, the BBC has no difficulties in presenting audiences with a summary of the cause of the conflict in Yemen and does not censor integral factors leading to its outbreak or use the formula “Saudi Arabia says”. “In recent months Yemen has descended into conflicts between several different groups, although the main fight is between forces loyal to beleaguered President Abdrabbuh Mansour Hadi and Shia Zaidi rebels – or Houthis – who forced Mr Hadi to flee the capital Sanaa in February. That, of course, is the difference between news and narrative.